Jefe Smith took a four day late November ride with some friends up along the east shore of the Salton Sea, through Joshua Tree National Park, the Mojave desert and Death Valley; then across the Panamint Mountains and into the lower Sierras. It was empty, beautiful and cold. He ended the trip by riding down to Desert Hot Springs to warm up and meet his family for Thanksgiving. 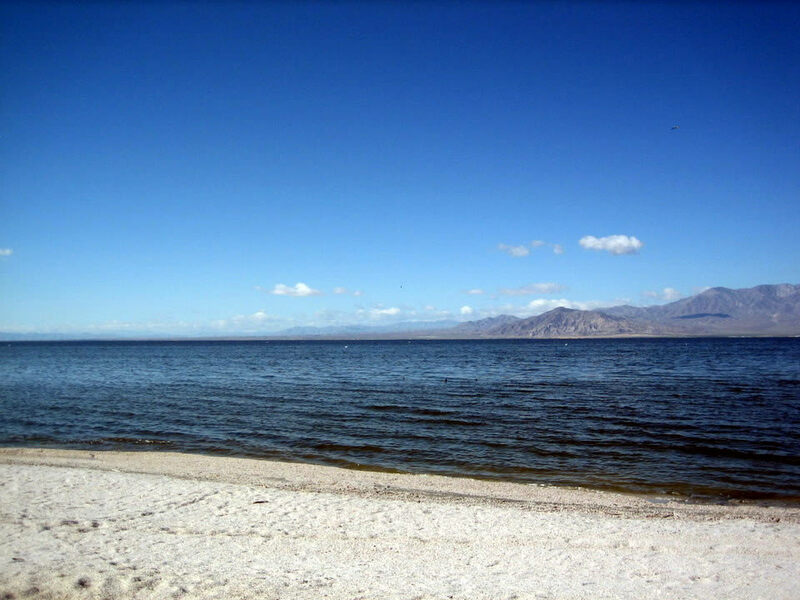 The Salton Sea was formed in a below-sea-level hollow when the Colorado River overflowed its banks in 1905. It has been slowly evaporating ever since. Replenished only by sparse desert rainfall and agricultural runoff, the sea is getting smaller and saltier each year. It is beautiful, surrounded by desert and mountains, but you can no longer swim in it. 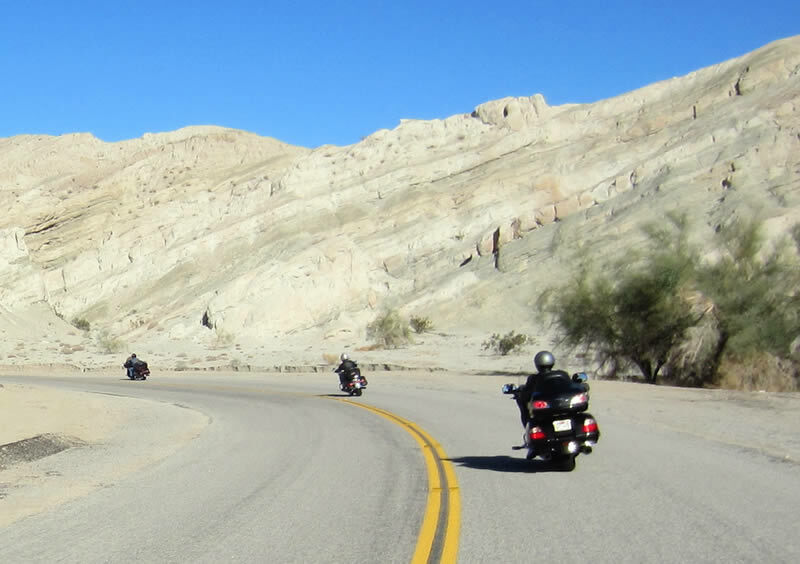 Riding in Box Canyon just south of Joshua Tree Park. Jefe in Joshua Tree National Park wearing five layers under the jacket and absolutely loving the heated hand grips on the Road Glide to ward off the 48 degree temperature. This is the kind of motel we favor on these trips. My wife would shoot me if I brought her here. 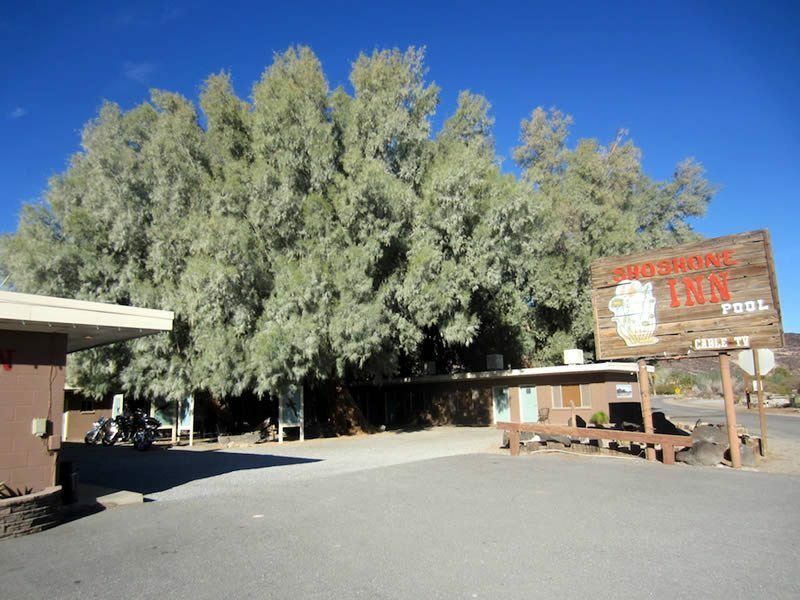 This one is in Shoshone, a four-building town south of Death Valley. Across the road was the Crowbar Saloon and Cafe. Under all the trees was a fire pit we enjoyed that night which fortunately did not torch the trees. I spent an hour that afternoon at nearby Tecopa Hot Springs, a funky place that puts men and women into separate hot pools and requires everyone to be naked. My riding companions looked at their boots, said no to the naked part and headed for the motel. I sat in the 104 degree water with a bunch of Japanese tourists and a couple of old tattooed desert rats who are used to that sort of behavior. Badwater reflection. Pretty artistic, eh? 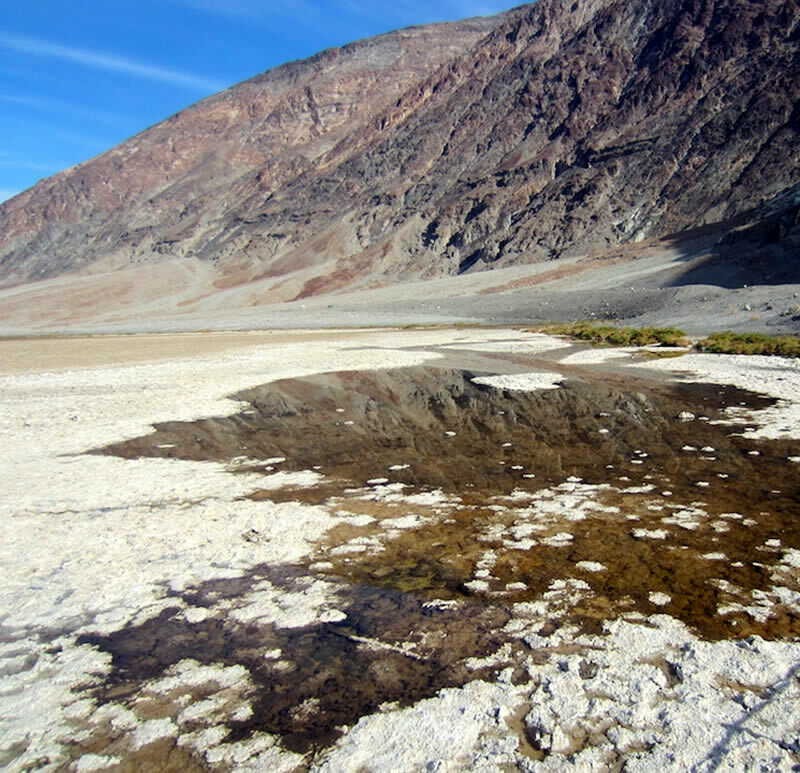 Badwater is 220 feet below sea level, the lowest part of Death Valley. It hit 129 degrees here last sumer, but was about 52 degrees this day. 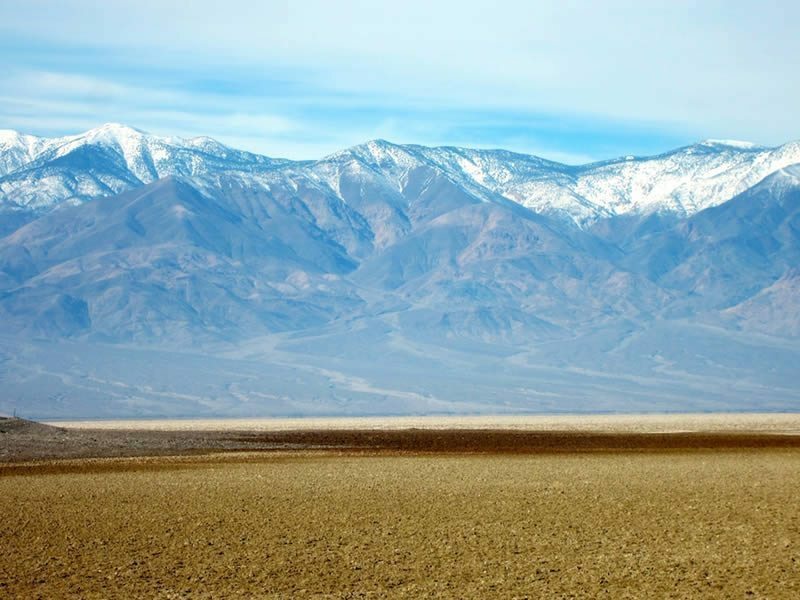 Panamint range from the Badwater mineral flats. The peak on the left is over 11,000 feet. Millions of years ago, a large piece of the earth’s crust tilted like a see-saw. One end tilted down and formed Death Valley which has been slowly filling in with eroded sand from the surrounding mountains. 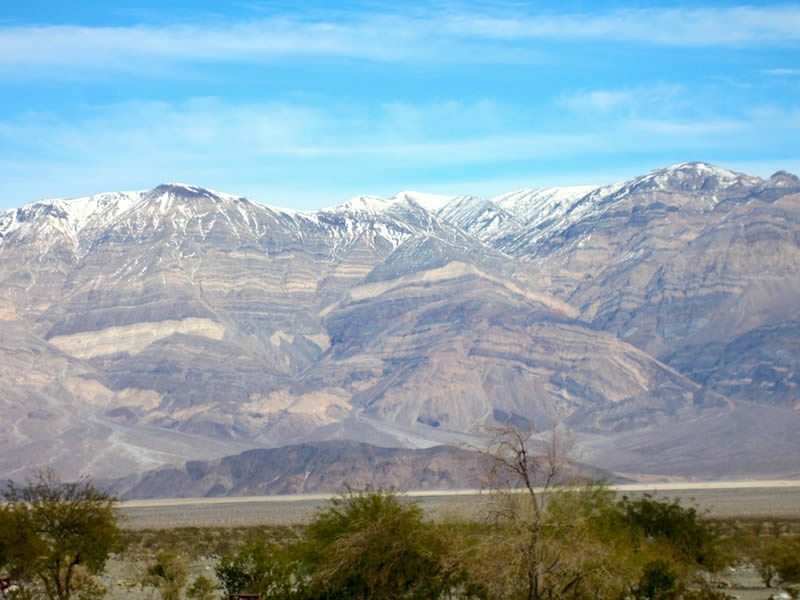 The other end tilted up and formed the Panamint Mountains. 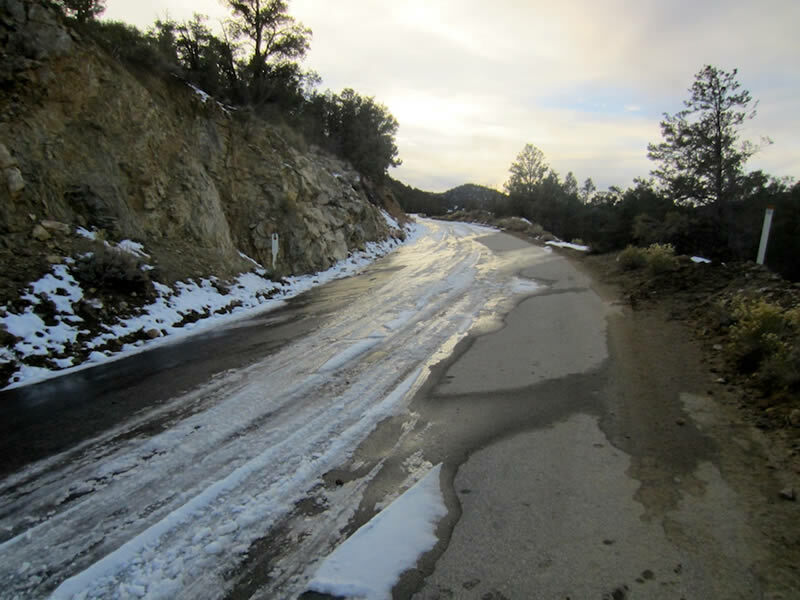 After riding through a 6500 foot snow covered pass, this picture was taken on the back side of the Panamint Mountains. All of the geologic layers are exposed since this is the exposed edge of the chunk of earth’s crust that tilted up. At Panamint Springs we ran into a Dutch woman who was touring Alaska, Western Canada and the U.S. on a dual sport motorcycle by herself for 10 months. Did not get a picture of the 6’4”, nearly 200 pound Amazon, but she looked like she could handle herself. End of the line in the Sierras. Trying to get over a pass we came around a corner and saw this. Actually the leader saw it a little late and went down. At 15 MPH he was uninjured and the bike only took minor damage. The peak of this pass was 2000 feet higher than this point. We decided the road could only get worse and we turned around and backtracked 30 miles to an alternate destination. Hope you all had a great Thanksgiving. 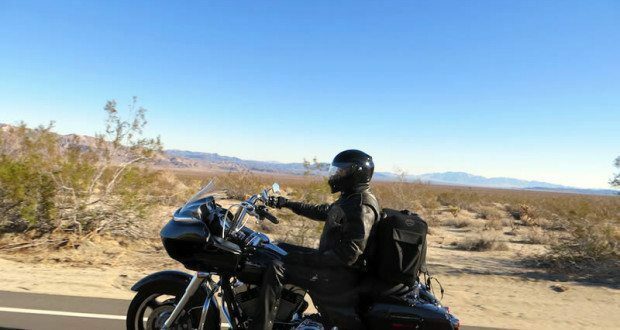 Geoff “Jefe” Smith has ridden motorcycles over 120,000 miles in the past 10 years, crossing the country twice and riding extensively through the western U.S. He has tested the asphalt in 29 of the 48 contiguous states and made three pilgrimages to the Sturgis Motorcycle Rally. Jefe’s Tours is a purely fictional travel agency formed with some colorful friends over way too many beers in San Felipe, Mexico back in the 80’s, but it more accurately represents the past and present experiences of one biker on many beautiful motorcycle rides through America and on one entertaining road through life. 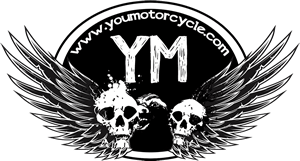 Jefe Smith continues to ride across America, 140,000 miles in the past 12 years. 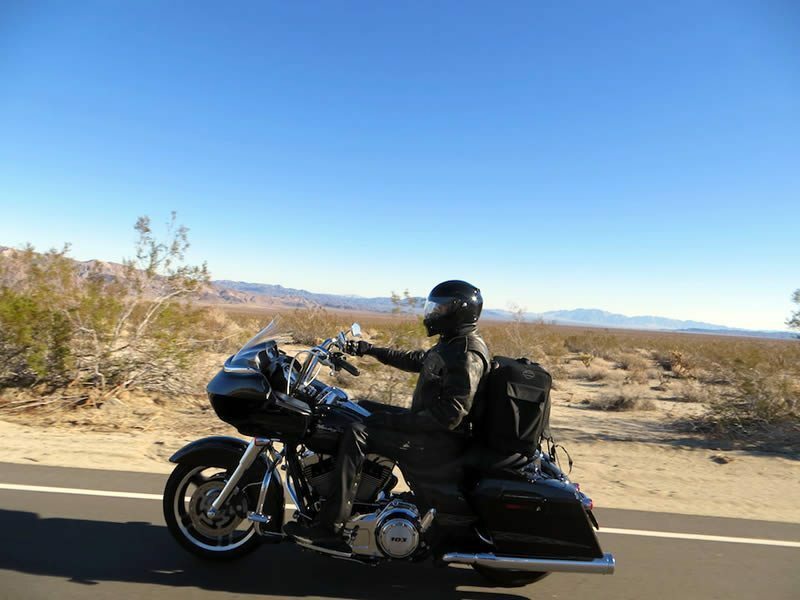 His irreverent storytelling of road experiences, life experiences and the America he discovers can be accessed in his first book, LIFE, AMERICA and the ROAD A Biker's Perspective, which has been well received by the motorcycle community. The ebook is available in the Amazon Kindle Store and signed hard copies are available at www.jefestours.com. 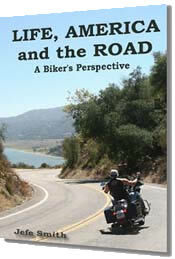 A second book, LIFE, AMERICA and the ROAD to KEY WEST A Biker's Perspective is due out in July of this year. There is just something brilliant about a fictional travel agency!! Di: I just picked up on your comment. When it was first formed in San Felipe, Jefe’s Tours plan was to specialize in Tours for the Naive as we figured this would be an easy clientele to please. The company tag line, which was meant to indicate the level of customer service we planned to provide was, “Only if they b**** (complain). In recent years there has been the suggestion that we rebrand the agency Jefe’s Detours with the new tag line, “Don’t mess up like the last time.” The board of directors has not recently achieved a level of sobriety which would allow consideration of the proposal.